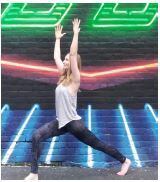 I am a 200hour Registered Yoga Teacher based in Cincinnati, Ohio. I live and teach by the Strala principles of ease, natural movement, having fun, and building community. Through my classes, you’ll build strength, flexibility, and balance – physically AND mentally. I have practiced yoga for over 15 years because I believe in the limitless benefits that come from connecting with ourselves and each other. Speaking of, I would love to connect with you! Please don’t hesitate to contact me by email or at the link below about my current class schedule, special events (such as parties, weddings, meet-ups, retreats, etc. ), or private yoga (one-on-one or small groups). Feel free to connect with me on Instagram, where I share my experiences exploring, through travel, yoga and friends.